Once in a while it is good to get out of the city and once in a while, it is good to move. 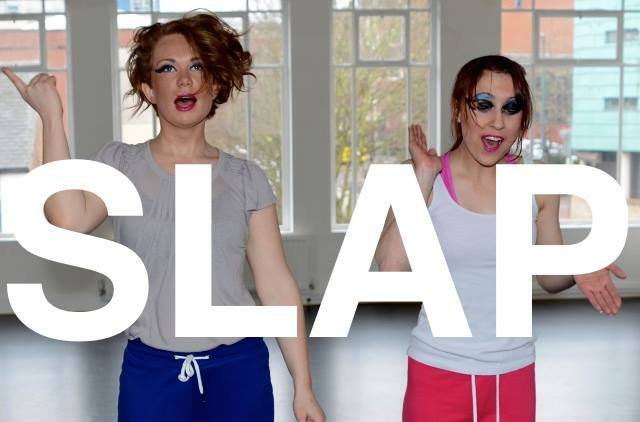 I managed both by attending #Slapmoves 2015 organised by SLAP or SALACIOUS LIVE ALTERNATIVE PERFORMANCE (best acronym ever) at The Guildhall in York. The SLAPmoves prize is all about emerging art from the next gen of pioneering talent. 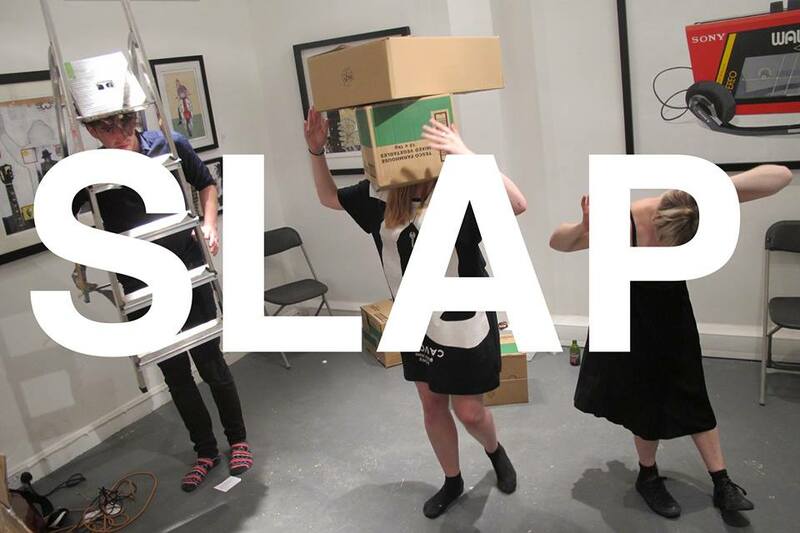 SLAP (Lydia Cottrell, Sophie Unwin and Pete Wise) has invited recent graduates and final year students (dance/theatre/film whose themes of focus are based upon movement) to submit proposals of new work. Throughout evening you will see shortlisted artists and works, an eclectic mix of dance, live art, film and music. So a bit like Danza! but with a prize. We do now have a Hull Dance Prize a new platform, responding to the increased visibility and awareness of contemporary dance/performance, to become an annual fixture on a dance calendar. First perf: Michael Robbins – GL_TCH A fragmented ballet, spaces pixelate bodies distort and sequences piece together in the wrong order. [Crib sheet] I saw pied performers, like chess pieces moving across the squared floor. Each face made anonymous, with only contours marked. Each with a purpose, sometimes mirroring, sometimes leading. Time pieces: arms as hands on a clock face. Even my untrained eye recognises the moments or movements of ballet, the sweeping gesture of the arm, the particular bend of the leg – that re-appears now as a half formed memory. As the perf continued – perhaps a little too long? – the shadows of the dancers lengthened, casting looming figures against the vaulted ceilings of the York Guildhall. Darting around wooden carved columns, as the offbeat noize, the glitch-tronica soundtrack, shifted from industrial to ambient, to precipice on an uncertain end. Engaging, but at times a little inaccessible for the initiate. ‘If the cello had hands it would play itself,’ a beguiling start point from where to create a perf about contact and consent. Arnold & Whittle – Touch Tales began with the cello encased, being used as a prop in a series of two-hander pseudo improvs: it was phallus, machine gun and coffin. So far so good, but when he begins to play, to stroke the instrument now exposed and in upright position, she questions his fidelity. Cello envy. Touch Tales moves through various scenarios, that invite the audience to question notions of acceptable touching, manipulation and abuse. There’s a moment of familiarity, recounting the awkwardness that arises when ever he goes to hug his father. A perf punctuated by audience participation, poignancy and a darker undercurrent of jealousy and desire: a must see. A short break and we switched seats now stage left front row; better view more in tune with the action on stage. Number 3 Christie Barnes – Agitated Atoms was beset with technical issues part way through and didn’t complete. I wrote: While teacher’s away the atoms will play, a tiny world indicated by holding an invisible precious thing in hands, curious eyes peering, intent on discovery. I am reminded of the poem about the whole world being inside a tiny grain of sand. Which you can read here. The choreography used that instructing device, where one ‘the one I’ve called the teacher but was possibly the embodiment of nature or energy itself, causes the dancers to pulse, flex and then in a physical recreation of Brownian motion, move randomly this way and that, across the stage. Chaos. So three down, three to go. 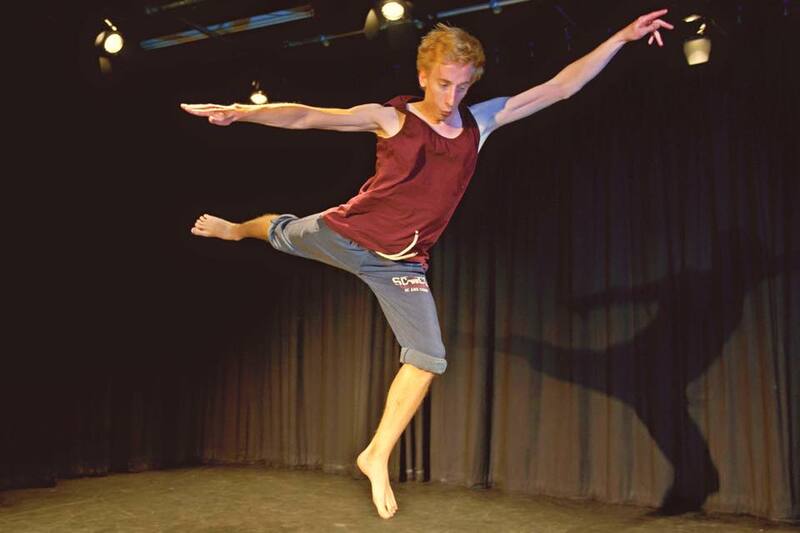 And next in tiny shorts and vest, legs bandied is Rhythm is a Daniel (see performer for correct pronunciation) Picture if you will, Napoleon Dynamite parodying elements of popular and contemporary dance, with ridiculous super poses and an arch, hyperbolic way of expression. He is everything you expect a star to be, self aggrandising over inflated ego, but just look at him, his pale legs, his pigeon chest, he is hardly the ripped Adonis of the glossies is he? No indeed. He is charisma and comic timing, he is storyteller and comedian. He is outrageously funny and if you don’t get all of the in-jokes about dance and performance, there’s enough to keep the layperson laughing in the aisles. I was lucky to be sat beside, prize-winning choreographer/dancer Jo Ashbridge, so was afforded a little insight. At this moment it all went gonzo, as I Michelle Dee, became part of the act. I am not a dancer, as many will testify to, but I began my interpretation of a peacock with no little gusto. I realised all too soon, that the raising of arms behind my back, with simultaneous bowed head, one foot behind other, was quickly going to become onerous. I loved it. Not so much all the eyes on me, but secretly you adore being picked on. I won’t tell you the nuts and bolts of the show Rhythm is a Daniel here. I rather hope he will bring it to Hull, he’s based in Leeds, not far away. The last of the contenders was Amy Lawrence – What it’s not/and then SOME. What it was I have no idea all were instructed to stand in the performance space and that was it. No more instruction or explanation. Dancers emerged from the shadows and seemingly from within the crowd and began a strange performance, that sometimes involved props but in a non-sensical way. I was lost and rather unnerved throughout. I kept looking into the eyes of the faces around me, was there something I was supposed to understand, was there a code? An object propped at the feet, did that mean something? The arms outstretched then almost shaping the crowd, like the woven net shapes the fish captured inside. And what about the footage projected upon a reluctant wall? A tourism trail, something historical from the archives? Now the dancer is inches from me, now lying face down head raised, prostrate at my feet. Is she the fish now flopping helplessly on her belly, out of the water? Were there ever any fish? Having been given a button at the start – the sort found in the sewing box – it was time to vote. Each audience member showed their preference, by dropping said button, into a cup secreted behind, what may once have been an altar. SLAPmoves 2015 then welcomed back the winners from the previous year The Disco Disco Project. Another parody perf this one concerning the cut throat world of disco dancing competition. Never mind all the rules and regs the competitors will sweat blood and fake tan, to get their hands on the prize. The other dancers in the room recognise this fighting spirit, this desire to win at any cost. Again a two-hander with one taking the role of instructor, demanding of the other bigger and better moves, more more More! Then primal roaring; a truly ungodly noise, but boy could she do a high kick. That stuff was electrifying such moves, such speed and a big song finish to boot. That was that, all that was left was for the winner to be announced the following Monday. And with the least formal performance, and with a leap in the air like a herniated goose, Dan Craddock with Rhythm is a Daniel won! Yes Dan Craddock has been crowned king of SLAPmoves 2015 and will have to return next year, if I have followed this format correctly. He wins a weeks residency at Yorkshire Dance (starting next week) a performance slot at YD event ‘Burst‘ on 1st May and a £250 bursary.